An acute ischemic stroke is characterized by the presence of a blood clot that limits blood flow to the brain resulting in subsequent neuronal loss. Acute stroke threatens neuronal survival, which relies heavily upon proper function of astrocytes. Neurons are more susceptible to cell death when an astrocyte is unable to carry out its normal functions in supporting the neuron in the area affected by the stroke (Rossi et al., 2007; Takano et al., 2009). For example, under normal conditions, astrocytes initially swell in response to changes in extracellular osmotic pressure and then reduce their regulatory volume in response to volume-activated potassium (K+) and chloride channels (Vella et al., 2015). This astroglial swelling may be overwhelmed, under ischemic conditions, due to the increased levels of glutamate and extracellular K+ (Lai et al., 2014; Vella et al., 2015). The increase in extracellular K+ contributes to neuronal damage and loss through the initiation of harmful secondary cascades (Nwaobi et al., 2016). Reducing the amount of extracellular K+ could, in theory, limit or prevent neuronal damage and loss resulting in an improved prognosis for individuals following ischemic stroke. Kir4.1, an inwardly rectifying K+ channel, has demonstrated an ability to regulate the rapid reuptake of this ion to return the cell to basal levels allowing it to fire again in rapid transmission (Sibille et al., 2015). Despite growing interest in this area, the underlying mechanism suggesting that neuroprotection could occur through modification of the Kir4.1 channel’s activity has yet to be described. The purpose of this reviewis to examine the current literature and propose potential underlying mechanisms involving Kir4.1, specially the mammalian target of rapamycin (mTOR) and/or autophagic pathways, in the pathogenesis of ischemic stroke. 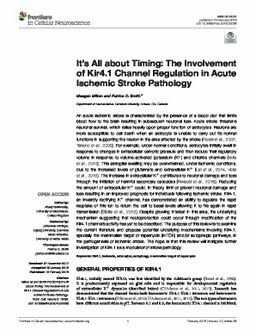 The hope is that this review will instigate further investigation of Kir4.1 as a modulator of stroke pathology. Note This Document is Protected by copyright and was first published by Frontiers. All rights reserved. it is reproduced with permission.